Any event can be made greener with advanced planning, communication, and follow-through. Wharton encourages both sustainable and zero-waste events. In our support of the University’s environmental goals, it is Wharton Operations’ objective to host ecologically sustainable events to the greatest extent possible. Being that Wharton hosts over 15,000 events a year, minimizing waste, sourcing local foods, bulk purchasing and similar pursuits have an enormous impact on decreasing our carbon footprint. Any scale event, from department-wide gatherings to small staff meetings, staff picnics to lunchtime seminars, can all be made a Green Event. However, due to major changes in the compost marketplace, items accepted as compostable are greatly limited. As a result, compost vendors will only accept food waste; compost containing any paper, bamboo or plastics, including those labeled as compostable (“Greenware” or otherwise), will be rejected by our vendor and sent to the landfill. Greenware and other compostable goods are now considered trash and must be discarded accordingly – even bio-plastic cups with a recycling symbol. This has obviously affected the approach to minimizing waste at events. In an effort to minimize waste, Operations has worked diligently with our approved caterers on a plan to minimize the impact of this marketplace change. It includes requesting that caterers substitute all Greenware and similar products with those that we can recycle or reuse. It is our hope that with this change we can separate our waste stream into 2 categories: compost for food waste and recycling for everything else. A list of approved caterers can be found here. Confirm that materials are reusable or recyclable and plan your communications strategy. Download a Green Event Guide (pdf) to help plan your event. If your event is being catered, speak with the caterer about options for reusable or recyclable plates, glassware, and utensils and, if reusable, a means to collect and return used service ware when your event is over. Confirm your strategy, get prices, and work out logistics well in advance of the event. Contact Wharton Operations for a list of recommended caterers. Penn recycles all plastics #1-7 so most plastic cups and service ware can be recycled. If your office, department, or student group organizes many events, you may want to consider purchasing reusable service ware in bulk to save money and be prepared for events with short lead time. 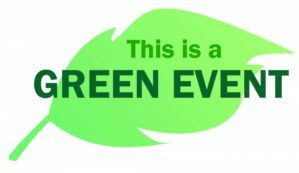 Include Green Event information on the event invitation to let attendees know your plans, and consider sending an email explaining how waste will be disposed of well in advance of the event. Standard trash, recycling and composting posters are available for download from the Penn Sustainability website. The Green Event graphic above can be customized for your event by pairing it with your School/Center, department, student group’s logo. Please use and disseminate these graphics as widely as possible so that members of Penn community can begin to associate them with sustainable events. One of the keys to a successful Green Event is clear and prevalent signage at the event, so that all attendees and servers know where to put their refuse. Display signage throughout the event space, including at the sign-in or registration table. Make sure staff know how to answer questions about the waste aspects of the event. Hang recycling and composting posters directly above the bins, or tape them to the bins themselves. Download signs here (pdf). Place recycling and composting bins next to one another so it is easy for your attendees to sort their refuse in a clear and convenient manner. Don’t forget to display signage where attendees are picking up their food so they know in advance that they are expected to separate and to dispose of refuse properly. Encourage the welcoming speaker to make an announcement during the event about what is compostable and recyclable, and why this is important. If your event has volunteers or catering staff, having someone stationed at the compost and recycling bins to help attendees can help prevent contamination of the bins. Remember to communicate back to guests the success of your event to build enthusiasm for this aspect of future activities. Whenever possible be sure to work with the caterer to provide a boxed lunch option with packaging that can be easily recycled or reused. Serve foods that do not need to be individually packaged such as fruits. Serve snacks such as popcorn, nuts, chips or cookies in bulk. Serve condiments such as ketchup, mustard and mayo in reusable or recyclable bowls or bulk dispensing bottles for everyone to use. Serve foods that do not require utensils. If food requires utensils, select recyclable serving and flatware. Select paper napkins that contain post-consumer materials, are designated as unbleached, or are made from a non-tree source. Select recyclable cups, plates and utensils. Avoid disposable water bottles. Offer water pitchers or refilling stations instead. Avoid drinks packaged in plastic bottles. Select drinks that are packaged in glass or metal containers or offer drinks such as tea or lemonade served from pitchers or refilling stations. Always notify Wharton Operations when planning to serve food at a meeting or an event so that appropriate housekeeping services can be scheduled. Do not use Styrofoam products. Do not use compostable service ware (boxes, cups, plates, utensils). These items are now considered trash due to changes in the compost marketplace. Do not use paper cups with poly liners. They are not recyclable. Do not use disposable packaging, such as saran wrap. Do not use individually wrapped packets of plastic flatware. Do not offer individually wrapped condiments (e.g. sugar or sugar alternative packets, salt and pepper packets, individual creamers, ketchup packets, mustard packets, mayo packets etc.). Do not offer individually prepackaged bags of chips. Always request your attendees sign up for meals before events and request that caterers bring food for the number of people eating at each meal to minimize food waste.